And we want our Bubbleator back! WTF, Happy 50th anniversary! Text me! Luv TomorrowLand. The Bubbleator was a giant bubble-shaped elevator made of acrylic glass and designed for a futuristic Seattle World's Fair attraction in 1962. 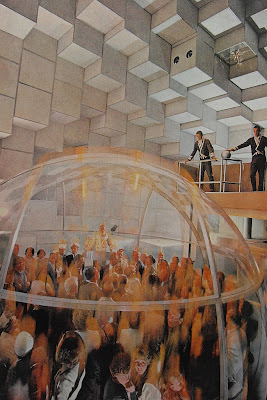 Inside, the Bubbleator operator sat in an elevated control chair and pushed a button to carry 100s of visitors each day on a voyage through a honeycomb of cubicle clouds into the World of Tomorrow. In truth, this Space Aged Bubbleator traveled just one floor upward on a 40-second ride into a galaxy of lights flashing on the cubes accompanied by the supersonic sounds of Attilio Mineo's Man in Space. Once in tomorrowland, there were glimpses of a streamlined futuristic city with architectural directions, the home of tomorrow, the factory of tomorrow, and even the formidable fallout shelter of tomorrow which was kind of a downer. (This was near the time of the Cuban missile crisis and nuclear threats afterall.) As a young girl in 1962, I can vividly recall waiting in long lines anxiously anticipating the short ride into the future. Unfortunately, Future World was not so good to the Bubbleator, and it met a sad fate in 1984 when it was removed and sold to a private owner who had originally helped build the orb-like space craft. The upper portion of the clear dome was recycled and is now sitting in his front yard as a giant greenhouse. Another icon of the 1962 World's Fair was the Century 21 logo created by R.T. Matthiesen and Associates who claimed that the arrow-orb form was intended as a scientific symbol representing man, and the hemispheric world symbol inside the man-symbol is supposed to represent the theme of Man in the Space Age. Vague yes—but purposeful, as the arrow suggests the great march forward into the future. :: The Bubbleator image is from Christian Montone. The Century 21 logo is from here.